E-A-R UltraFit Reusable Ear Plugs Corded (NRR 25)5KwAugust 14, 2016These are by far the Best Sealing ear plugs I've used to date. They Work quite well and even Quell the sharpest of noises. 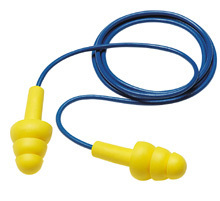 E-A-R UltraFit Reusable Ear Plugs Corded (NRR 25)5Scorpion8May 1, 2015Very easy to use and most importantly - very easy to put in and get a good seal. I use them in North Slope work in major oil and gas facilities. 2 Thumbsup! E-A-R UltraFit Reusable Ear Plugs Corded (NRR 25)5Alan JDecember 3, 2013These are my favorite hearing protection. They last for a very long time, can be easily cleaned in soapy water. You are less likely to misplace them as the cord keeps them around your neck when not in use. E-A-R UltraFit Reusable Ear Plugs Corded (NRR 25)5Fred JayJune 14, 2011If you want a quiet nap, a quiet night's sleep, a quiet flight on an airplane or keep water out of your ears while swimming, etc etc, buy these excellent ear plugs. They are very comfortable, easy fitting and they do the job. I can even take a quiet nap with my screaming grandchildren in the next room. Been using them for years with great satisfaction, the very best! This is the place to find quiet in your life. E-A-R UltraFit Reusable Ear Plugs Corded (NRR 25)5David SewellDecember 29, 2010I bought a pair of these somewhere around 5-6 years ago and have used them regularly for outdoor work in all conditions (mowing, using chainsaw, etc.). I finally bought another pair just to have another set, as the originals were still quite usable.